Breastfeeding is a special time in the life of both mother and child and experts explain that breast milk is far superior to artificial feeding, which is associated with a general decreased state of health and more infant deaths from diarrhea in both developing and developed countries. Unfortunately even though mothers may choose to breastfeed, they often experience difficulty in the supply and production of breast milk. They may also unknowingly have a problem with low quality breast milk which can result in the baby not being completely satisfied with feeds. Breast milk production and supply are not the same thing and each is influenced by different factors. A mother can have either a problem with production (usually hormonal, obstructive or due to improper feeding habits) or supply (most often due to poor nutrition or weak constitution) or both. Sometimes there can be no problem with supply or production of breast milk but the quality of breast milk may not be sufficient to satisfy the baby. Traditionally modern medicine only accepted problems of insufficient production but now with advances in technology that enable us to measure the quality of breast milk it is now accepted that these three problems mentioned above are all real conditions that need to be addressed appropriately in the breastfeeding mother. In order to understand how to address problems of low breast milk or insufficient lactation we need to understand how and when breast milk is produced and what factors are involved in the production, supply and quality of breast milk. Breast milk is produced under the influence of certain hormones that are released after birth, these include prolactin and oxytocin. The release of these hormones is directly related to the act of the baby suckling on the breast which in turn stimulates the nerve endings present in the areola of the breast and cause the release of these hormones by the pituitary gland. Prolactin causes the alveoli or glands within the breast to take nutrients from the blood supply and turn them into breast milk. Oxytocin on the other hand is responsible for the contraction of cells around the alveoli and subsequent release of the breasmilk through the breast ducts and out through the 15 to 20 openings in each breast. It is rare that insufficient lactation can be caused by a problem of the pituitary gland, more often cases of non-secretion are due to insufficient stimulation of the nerve endings by the baby not latching or sucking appropriately or indeed not suckling at all in cases where the baby may be unable to feed or the mother is unable to. In these cases it is encouraged to use proper posture and also use a pump in between feeds to encourage breast milk production. Obstruction of the breast ducts is a fairly common occurrence and usually is associated with inflammation of the breast (mastitis) but may be due to other causes such as injury or previous surgery to the breast etc. Fortunately it is easy to treat, a doctor could prescribe an anti-inflammatory or you could use natural herbs such as mu tong or fenugreek which has been traditionally used to open the breast ducts, reduce inflammation and promote milk production and flow. Some of the natural supplements to increase breast milk contain these ingredients and will be discussed later in this article. Fatigue and stress can play a part in any illness and is a common occurrence postpartum. For some this may even be serious enough to be considered postnatal depression. Both stress and fatigue can affect the function of both prolactin and oxytocin as energy is required for all bodily functions to occur including contraction of the muscles responsible for promoting the flow of breast milk. Mothers should get sufficient sleep and also eat healthy to combat fatigue. Stress can be eased by getting help in managing the baby from friends and family. Some natural postpartum supplements can also assist in reducing fatigue and stress. These will be discussed under the supplements section. The quantity and quality of breast milk is largely influenced by the health and nutritional status of the mother. Studies have shown that nutritional status affects more the quality than the quantity of breast milk so that often a mother will be producing enough milk but the quality and nutritional value of that milk may not be sufficient to provide optimal growth for the baby. Often the body will be able to provide sufficient protein and fat content for inclusion in breast milk by taking this from the mothers blood supply and if necessary by breakdown of the mothers own protein and fat stores. However the inclusion of vitamins, minerals and other essential substances will be directly affected by the mothers intake of these substances. Besides a healthy and varied diet, dietary supplementation is also recommended to increase the production and supply of quality of breast milk, especially so when the mother is experiencing insufficient breast milk quantity to begin with. In the next section I discuss some available postpartum herbs and supplements for increasing breast milk production and supply and which are the best to use. Fenugreek is useful where stress may be a significant factor in causing low breast milk however we do not recommend that it be used alone due to its other effects described above. In fact traditionally herbs were more often combined with others so as to limit their toxicities and harmful effects while retaining their beneficial ones. For this reason we recommend one of the two synergistic formulas below for low breast milk and in fact the second supplement can also be used as a general postpartum supplement. Traditional Chinese Medicine places a lot of emphasis on proper postnatal care and over a period of hundreds of years developed and refined herbal formulae for that purpose. Lactaboost is based on a number of these formulae and is supported by clinical research that confirm the benefits of it improving and increasing breast milk. Sometimes the above approaches may not work and it is then useful to consult with a lactation consultant and/or other natural therapist who can work on an individual basis with you in order to prescribe a regimen, remedy or diet plan etc to address your specific condition. As an example a practitioner of Chinese Medicine will take a history, look at your tongue and feel your pulse in order to determine what the root of the problem is. In cases of low breast milk this may be due to liver qi stagnation, blood deficiency, liver fire causing mastitis or kidney and digestive weakness. After making a diagnosis the practitioner would compose an individualized formula to treat the root condition and may also add ingredients known to treat the branch or manifestation of the root problem. Congratulations on your pregnancy. You are eagerly waiting for your unborn child to come out into the world in a few months time. How about considering doing some yoga? Medical research has shown that working pregnant women, tend to find the birth pangs bearable and can give birth without much pain and hassle. It is a proven method. Yoga is an ancient exercise form which originated in India and is now popular worldwide. Several men and women have experienced immense benefits from doing it. That is because it is easy to do, you do not need too many accessories, and you can practice it anywhere. In this article, we will read some yoga exercise for pregnant women. The yoga pose is simple. 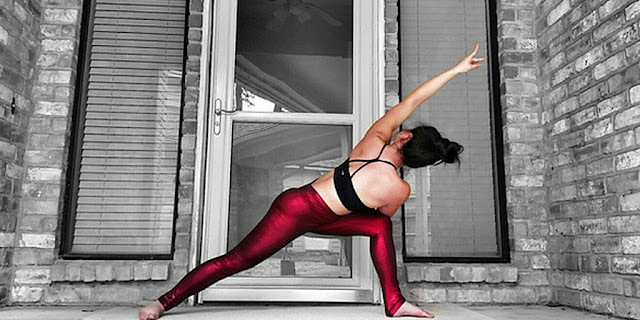 You need to sit down in a straight pose and then stretch your feet in the front. Then raise both your arms with palms facing down and inhale deeply. Now, exhaling, you will want to twist your body and then move your hands and head simultaneously. Avoid bending the knees and wrap your arms as much as you can. The chair pose is considered difficult but is extremely beneficial to keep fit during pregnancy. For this yoga pose, you will want to stand straight with your feet little apart from each other. Then you will want to inhale for few seconds and then lift your arms. Then slowly exhale and sit in a squatting position using your toes if possible or use your feet flat. The angle post is helpful to improve the waist and reduce the fat. You should stand in a straight position and keep your feet wide apart from each other. Then lift one hand up and stretch upwards. Then inhale and bend sidewards on the other side. Exhale and repeat the same using the other hand. You can take the help of somebody when doing these yoga poses. 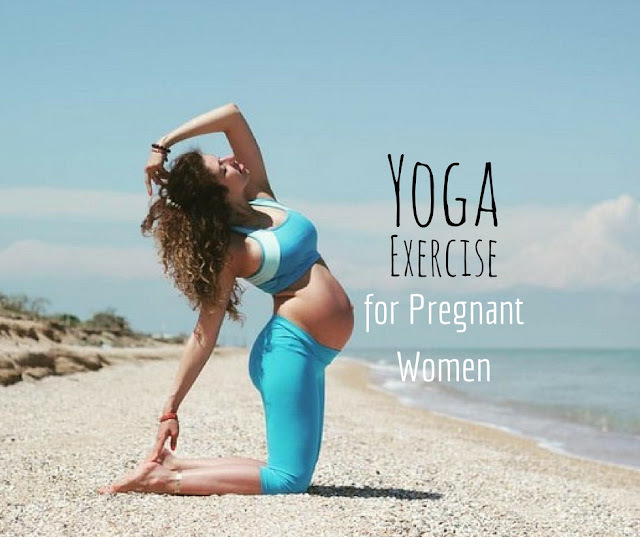 When you are reaching your eighth or ninth month of pregnancy, some yoga exercises for pregnant women are not the type of activities to be during this time. These are crucial times for both mother and the baby inside. You will want to consult with your doctor and take his/her advice before adventuring into yoga asana. You never know what might happen. Here you are trying to do something good and certainly don't want anything untoward happening. However, it is advisable that you join yoga classes with other pregnant women. There are classes held in several cities, and you can surely find one in your location. When doing yoga exercises, you will want to make sure that you never over stretch your abdomen area. Similarly, when you are twisting your body, you should avoid using your stomach area and instead use your upper back and your shoulders. 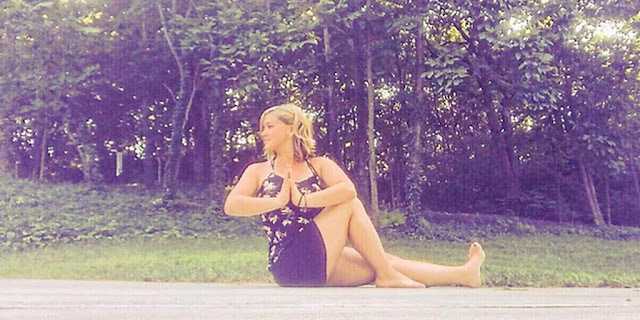 Never be too bothered when you are unable to perform some asana, unlike other pregnant women. When there is pain or discomfort, you will want to take rest or stop exercising immediately. It is always better to be safe than sorry. Yoga exercises must be performed such that you enjoy doing them and they help you during your childbirth. Find the Best Weight loss strategy, eBooks, Diet eBooks and great Health & Fitness Articles about exercises, strategies, guides, plans & tips on Weight Loss. One of the most known pregnancy symptoms is the lack of proper sleep and constant fatigue of the pregnant woman. There are many reasons for this fatigue some of them are that sleeping with a large belly and enlarged breasts is less comfortable. Doctors recommend pregnant women to sleep on their left side, in the third trimester. It is thought to be healthier to the mom and the baby. But what happens if the pregnant mother sleeps on the right side? What are the direct risks? There are two main risks expected those who sleep on the right side of the body. One is that the mother might experience varicose veins in the legs, and that the baby might suffer a decrease in the fetus heart beat rate. During the pregnancy month the woman body goes through many physical and hormonal changes. Inner organs grow and expand. It is these changes which make the sleeping on the right side more hazard than lying on the other side. The fist side effect you can expect when sleeping on the right side, is that a very important vein called 'Vena Cava' will be pressed by the growing uterus and the blood flow back to the heart will be slowed down. If the blood circulation through the veins is interfered, blood will begin pooling at the lower body. This pooling can cause varicosities - varicose veins, to be created. Varicose veins though not dangerous can be itching and very painful. Those with a light condition of varicosities may experience a severe condition if lying on the right side during the third trimester. The second side effect worth to know, for those who sleep on the wrong side, is that in recent years, it has been searched and found that when the mother is lies on her back, the baby heart beat slows down! A decrease in the baby heart rate means there is some pressure places on the vital blood supply to the baby in the uterus. The best heart rate was measured when the mother was sleeping on the left side of the body at night. There are other side effects which were recorded over time concerning the sleeping position of pregnant mothers. Some of them were related to digestion and suffering from heart-burns. Those pregnancy symptoms could be reduced too by some easy changes in the sleeping habits. There are some guidelines and bed time accessories which can help those with light sleep have a better night sleep. You can read about them in the article links below. Sleeping On Right While Pregnant Is it Safe AND also How to Eliminate Breast Stretch Marks During Pregnancy. I.V.F or In Vitro Fertilisation is one procedure that is used to overcome fertility issues to give a couple their best chance at having a baby. IVF treatment is coordinated between the fertility doctor, fertility clinic and the couple. Apart from the fertility doctor couples have access to other staff at the fertility clinic including nurses and counsellors. The IVF Procedure is relatively simple and is the joining of an egg and sperm in a specialised laboratory - outside the body. The fertilised egg or embryo is allowed to grow for some days in a protected environment before it is placed into the woman's uterus to increase the chances that a full pregnancy will occur. The actual fertilisation process takes a few hours and in this time a number of embryos' can form. Embryo's are usually *grown* for 5 days as they are then more likely to implant into the uterus. Once fertilised the embryos are transferred into the woman's uterus in a procedure similar to a pap smear. Your first appointment with the fertility doctor - your specialist will review your medical history and any previous investigations and treatments. You and your partner should attend the first appointment together. Hormone stimulation - The Follicle Stimulating Hormone injections are performed via a diabetic style pen that stimulates your ovaries to produce more eggs than normal. There is a higher chance of fertilisation and pregnancy if more eggs can be collected. Treatment Monitoring - throughout your cycle regular blood tests are used to measure your hormone levels and ultrasounds measure the size and number of your ovarian follicles. This also assists in working out the best time for collecting eggs. Trigger Injection - egg collection is planned once the optimum number and size of follicles is achieved. You then receive a trigger injection of HCG (Human Chorionic gonatrophin) in the evening with the operation to retrieve the eggs performed 36 - 38 hours later. This injection helps to *trigger* ovulation. Egg collection - egg collection is performed as day surgery under ultrasound guidance, you will be at the hospital for 4 hours and will need someone to drive you home. You must have the day off work. On the morning of your egg collection, your partner must be able to supply a fresh sperm sample to fertilise your eggs. Transferring the embryos - the transfer of embryos is a simple day surgery procedure and takes place 5 days after the egg collection procedure is similar to having a pap smear. Pregnancy test - the nurse at the fertility clinic will organise an appointment for you to have a blood test two weeks after the embryo transfer. If the blood tests are positive an ultrasound will be scheduled for 3 weeks later. Is There A Link Between Gut Health and Autism? Autism Just Doesn't Affect The Child Diagnosed It Affects The Whole Family. It's such a misunderstood disorder and has been linked to many possible factors. Although the child with autism may be in physical pain and have trouble communicating, the family shares their pain as well. It can be especially frustrating before you know what the issue is. When CJ was young, I knew that he was in pain and felt helpless at first. Then, my inner warrior kicked in and I found out all I could about autism and how to heal my son from the inside out. Autism used to be blamed on the mother and the children were often hidden out of sight at home or in an institution. As more research sheds light on this complicated disease, and more children are diagnosed correctly, more people speak out on the effects autism has had on their children as well as families. Recently Kelly Preston was on the tv show The Doctors and she shared her feelings about what contributed to her son Jett's autism and seizures. She feels there were several factors involved. During pregnancy she had food poisoning, which she feels affected Jett as well. A hard and fast delivery resulted in a ruptured placenta, causing a high fever. Kelly was given antibiotics to combat the infection. Kelly asked 3 doctors if it was safe to take medication and breastfeed at the same time. They all told her it was OK. Well, Jett got thrush, a yeast infection-Candida-that often results in leaky gut syndrome as well as other gut issues. I believe the gut is a key issue in the cause of autism. When I was pregnant with CJ, I had two bladder infections and was given antibiotics both times. No one ever told me to take probiotics during and/or after I finished the medication to replenish my good gut bacteria. I believe that had I taken probiotics after the first infection, I would not have gotten another one. I really believe this affected CJ as he was born with cradle cap-another type of yeast/Candida infection. Many children with autism have leaky gut syndrome. Giving pregnant women antibiotics without telling them about the importance of replenishing their gut bacteria with probiotics is the real problem and the beginning of a major catastrophe ahead. Poor CJ had stomach issues when he was a baby. He threw up all the time and cried. People told me he would grow out of it-that he was just colicky or a fussy baby. I wish I knew then what I know now about the importance of probiotics. He wouldn't have had to suffer so long until we began to heal his gut. CJ was miserable and in pain the first few years of his life until we discovered fermented and cultured foods. Once we began to replenish the good bacteria in his gut, CJ slowly began to heal. Your gut health influences your child's future over-all health. Research has linked a mother's gut flora to her baby's gut flora. In fact, your gut flora changes each trimester to help support the baby's growth during pregnancy. Babies with a vaginal birth have more diverse gut flora than babies born by C-section. Researchers think that this may lead to better health as they grow up. So if you eat healthy and keep your gut bacteria balanced, your baby will have a balanced gut. It seems so simple, but how many OB/GYN's are informing their patients about this? I was told to take my prenatal vitamins with folic acid, but never told about the importance of gut health. I know part of the problem is that gut bacteria has only recently gotten the attention it deserves, so maybe my doctors just weren't aware of the importance of a balanced gut. Seventeen years later, I wonder how many doctors recommend a balanced diet including fermented/cultured foods to balance gut bacteria? Or how about recommending a "No Sugar Diet?" so that if there is a yeast infection in her body, it won't feed and thrive on the added sugar? That's an easy place to start! So who wouldn't want to replenish their good gut bacteria? Doctors are ordinary people faced with an extraordinary job of healing people. They do not have all the answers, nor do they know all the questions to ask. Read and learn as much as you can about the importance of a healthy gut BEFORE you get pregnant. You will be given so much advice from doctors, friends, family and even strangers! Don't take it all as the only truth, but at the same time don't discount what someone has to say. Not all "old wives tales" are fantasy; most of them have been handed down for generations. Our ancestors knew the importance of fermented/cultured foods, but we began to push this in the background as processed and convenience foods inundated our culture. Sometimes simple is better! Is Their Proof That Fermented Foods Work? People always ask me that question, and I have three answers for them. First, YES! CJ is living/breathing proof of a healthy boy thanks to probiotics. Second, history and our ancestors have shown the importance of fermented foods. We don't do what they did anymore and it shows in the state of our health today. Obesity and diseases related to inflammation are skyrocketing! Let's go back in time and eat simply and healthy! Third, don't believe me, all you have to do is go to your favorite web browser and type in benefits of fermented foods to read all about the research proving the benefits of fermented/cultured probiotic foods. It's amazing how much money is being spent on research proving what our ancestors knew so many years ago! Keep in mind, it's just FOOD. So try some cultured/fermented foods. You'll be glad you did! The company's CEO and Founder Tamara Yapp, a mother of seven and wife, is the lively, relatable host at RealFoodRealLife.tv. She created this company and this show to provide information on the newest and most effective ways to lead a healthy lifestyle.